Uyue mini photo studio light box is perfect for photographers, it is specially designed for artists and online sellers, beginners can also use it to learn to shoot professional photos. ✔ SIZE & USAGE - Product Size: 8.7"x9.1"x9.4"; the mini photo studio box is perfect for quick and easy shooting of small products such as jewelry, watches, gadgets and other accessories. ✔ EASY TO INSTALL - Just need few minute to assemble your own photo studio anywhere, unfold this LED light box studio to get the perfect backdrop for a small item. ✔ 2 LED LIGHT STRAPS - It adopts imported high quality led to guarantee the level of color rendering index, greatly restoring the product color; LED strips are powered by the 2 coming USB cables. ✔ MULTI SHOOTING ANGLE - 2 openings allow photographing in any angle, to add the high angle shoot compared to tranditional photo box. 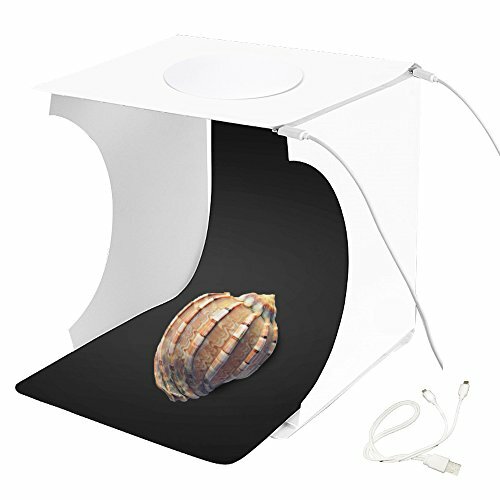 ✔ EASY TO CARRY & STORAGE - About the size of a piece of paper, you can assemble your own photo studio in minutes, and easy to fold up this LED light box into the coming storage bag. If you have any questions about this product by Uyue, contact us by completing and submitting the form below. If you are looking for a specif part number, please include it with your message.